Bodoland University Employees Union (BUEU) observed strike on Thursday for the second time demanding early implementation of 7th CPC for State universities. Talking to reporters, Parag Pratim Saikia, General secretary of Bodoland University Employees Union said that Bodoland University Employees Union (BUEU) and the officers under CPC scale, under the Banner of All Assam University Employees Federation (AAUEF) observed two-hour token strike against non implementation of 7th Common Pay Committee (CPC) on 19th April 2018, for the second time. He said that the union demand for early implementation of 7th CPC to the employees of the State universities of Assam, as the other State government employees of Assam have been enjoying the benefits of revised pay scale since April, 2016. 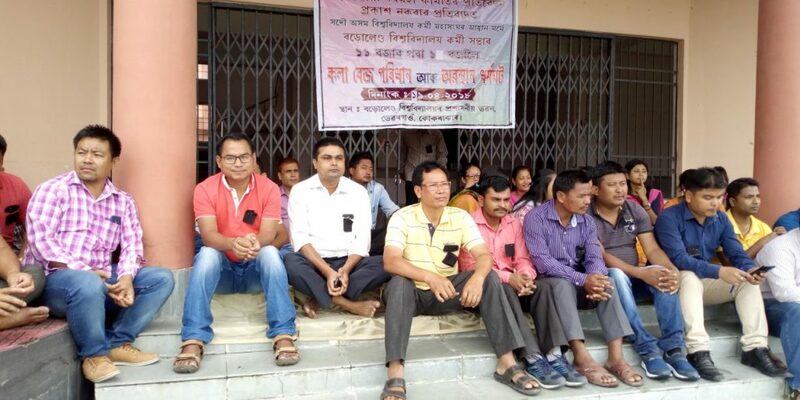 During the strike, the Vice Chancellor of the university met the agitating employees and informed that he had done all which he could do on his part for early implementation of the 7th CPC for the non-teaching employees of the State universities of Assam. The committee formed for preparation of the 7th CPC report for the NTS of the State universities had submitted the report in the month of January 2018 to the Governor and Chancellor of State universities of Assam, who had since forwarding the report to the State government for early implementation of the CPC report on new pay scale for the university employees, but till date the State government has not taken any step for its implementation. “The union has demanded early implementation of the 7th CPC report for the Non-UGC scale employees of the State universities of Assam,” he added. Saikia also said that they would intensity their agitation if the new pay scale is not implemented.